Young people are taking longer to transition from adolescence into full-fledged adulthood – this new developmental phase, called emerging adulthood, can hold great opportunity but presents unique challenges to modern families. In this webinar I’ll talk about what parents of emerging adults can expect, and what goes into building strong family relationships through this stage of life. I’ll focus on specific conversations that families can have now, and give tips and techniques for improving communication, to strengthen family relationships and avoid common pitfalls. Cassie coordinates the NAA Career Webinar Series along with a few other student to alumni networking programs. She is passionate about bringing important career topics in front of the Northwestern Network. Jacob Goldsmith is the coordinator of the Emerging Adulthood program at The Family Institute. Dr. Goldsmith developed the Emerging Adulthood program to help understand and meet the changing needs of emerging adults (clients in their early 20’s to early 30’s) and their families. Dr. Goldsmith serves as teaching faculty and group supervisor in the master’s program in Marriage and Family Therapy at The Family Institute. In addition, Dr. Goldsmith is the Principle Investigator of the Psychotherapy Change Project, a research initiative dedicated to the study and practice of empirically-informed psychotherapy. Dr. Goldsmith has a passion for clinical work with emerging adults — alone, in couples and with families. He has been privileged to speak and consult nationally and internationally on topics related to emerging adulthood, adult parent-child relationships, psychotherapy change processes and empirically-informed therapy. Excellent webinar. Jacob was a very informative presenter. I really liked the information and thought people asked good questions. It was a good discussion and helped me understand some of the complexities of dealing with my children who are emerging adults. More like this. These are very important ideas for your alumni and very predictable as well. So you can be sure similar offerings will be well-received. The quality of moderation was also high. It would be nice to switch the speaker's video to full screen when a slide is not being shown. A few good general tips, but not too much new here. Also, could not hear the questions being asked and the speaker did not recap them before answering. Very different from the typical 'how to help your kids while in university' - I found the insights really helpful to think broadly and long-term. Thank you! 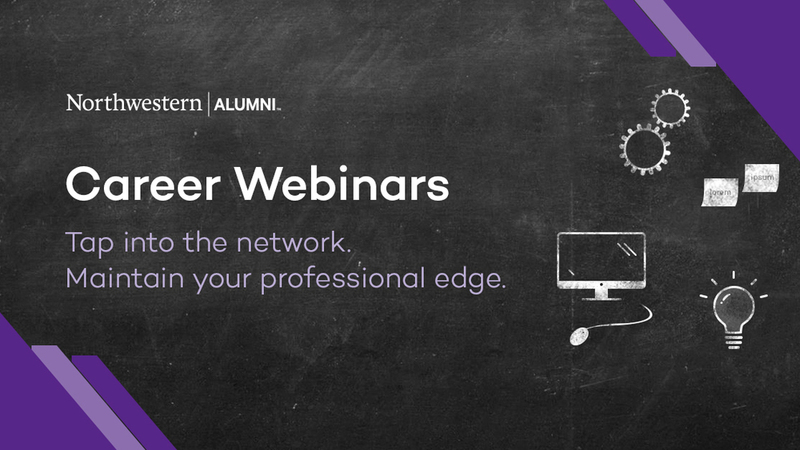 The Northwestern Alumni Association believes in life-long career development to help you maintain your professional edge. Through our free career webinars, we give you the opportunity to learn from industry experts about a wide range of professional topics.